When I was a child, there were still working horses on the streets, though motor cars had been around for over fifty years. The milkman, the coal merchant and the rag-and-bone man all had horses. One of my earliest children’s books had a picture of a milkman’s horse ‘eating its breakfast out of a nosebag’. A familiar sight to me, which no modern child in London would recognize. The change from sail to steam on the seas was also gradual. One of the most stunning scenes in Mike Leigh’s film, Mr Turner, is a reconstruction of Turner’s famous 1838 painting, The Fighting Temeraire tugged to her last berth to be broken up. While Turner captures a single moment, in the reconstructed scene, we see the ship and the tug in motion, with steam from the funnel puffing clouds into the air. Actually, we learn, that moment never happened, as HMS Temeraire was already partly stripped when she made her last voyage up the Thames. Turner wanted to show that the age of sail was passing, but he was ahead of himself. The advent of steamships did finally put paid to the schooners and the clippers of the merchant navy, but throughout the 19th century, sailing ships and steamships coexisted. 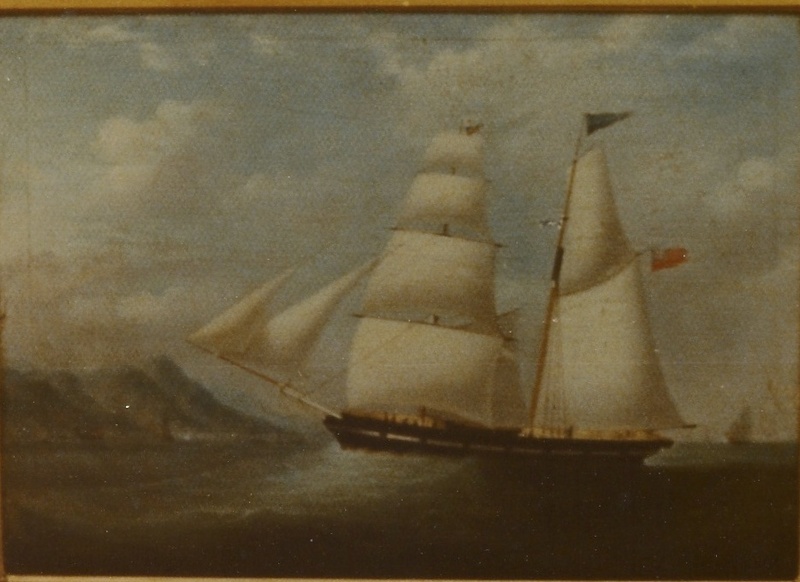 One of my ancestors, Captain Thomas, was a master mariner in the merchant navy and skippered a small, 145-ton schooner called the Laura Ann, north and south along the west coast of South America. In a memoir of 1842, he described the following incident. He was carrying as a passenger a certain Captain Robson, who was anxious to get to the port of Yquique, on the coast of Chile, where he was to land some cargo he planned to sell. This was a minor port, and he could avoid paying the heavy duty owing at major ports. When the Laura Ann was six or eight miles from the port, as he thought, he left the ship and rowed towards the shore, to be ready to unload the cargo. Unbeknownst to him, the schooner had drifted much further out to sea during the night. By this ploy, Captain Robson suffered no delay in personally overseeing the landing of his cargo. Clearly, the idea of a steamer towing a schooner into harbour was a huge joke. What a wonderful painting of the Laura Ann under full sail! Enjoyed reading about your sailing ancestor off the coast of South America. I wonder what was so special about that cargo? If you’re interested in the period, there is an extraordinary novel set in Chile and California during the gold rush, written by Isabel Allende – very evocative of the landscape/seascape – a very good read if you like her style, as I do.It’s called – Daughter of Fortune.